It seems like the interest in the enteric nervous system has been going through a Renaissance lately. Some scientists even call it “a second brain” now for its ability to call the shots in certain matters. However, “The system is way too complicated to have evolved only to make sure things move out of your colon,” says Emeran Mayer, professor of physiology, psychiatry and biobehavioral sciences at the David Geffen School of Medicine at the University of California, Los Angeles (U.C.L.A.). (3) “A big part of our emotions are probably influenced by the nerves in our gut,” Mayer says. That feeling of “butterflies” in the stomach is just one example of the gut’s response to excitement, fear or stress. “A lot of the information that the gut sends to the brain affects well-being, and doesn’t even come to consciousness,” says Michael Gershon. After all, 95% of body’s serotonin is found in the bowels. Serotonin is best knows as a “feel-good” neurotransmitter involved in preventing depression and regulating sleep, appetite and body temperature; it transmits signals from the gut to the brain. Research shows that stimulation of the vagus nerve (that sends signals from the gut to the brain) can be an effective treatment for chronic depression that has failed to respond to other treatments (The British Journal of Psychiatry, vol 189, p 282). Pankaj Pasricha, director of the Johns Hopkins Center for Neurogastroenterology in Baltimore, Maryland, points out that without the gut there would be no energy to sustain life. 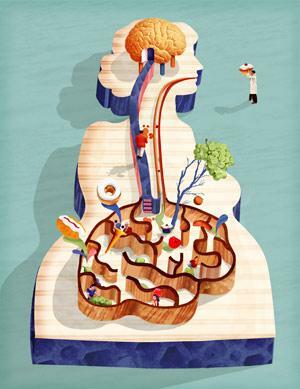 “Its vitality and healthy functioning is so critical that the brain needs to have a direct and intimate connection with the gut,” he says. (2) That connection is maintained via the vagus nerve. I am sure you have heard of the vagus nerve. All of the sudden everybody is interested in stimulating it, either via electrodes planted in the body or other, more holistic methods (like yoga and acupuncture); and there are definitely good reasons for that. Next week we will talk about those reasons, recent research related to the vagus nerve and how yoga practices fit in the equation. Tune in! Go Olga! Love this. So cohesive with Ayurveda’s view that all disease begins in the gut.Can’t wait for the vagus post. Lovely, Olga. I teach a therapeutic class series called Yoga for Healthy Digestion and will share this with my students today! Much appreciation for all the timely resources you offer. Previous story Should we engage the abdomen all the time? Next story Vital Vagus: What is the vagus nerve and what does it do?